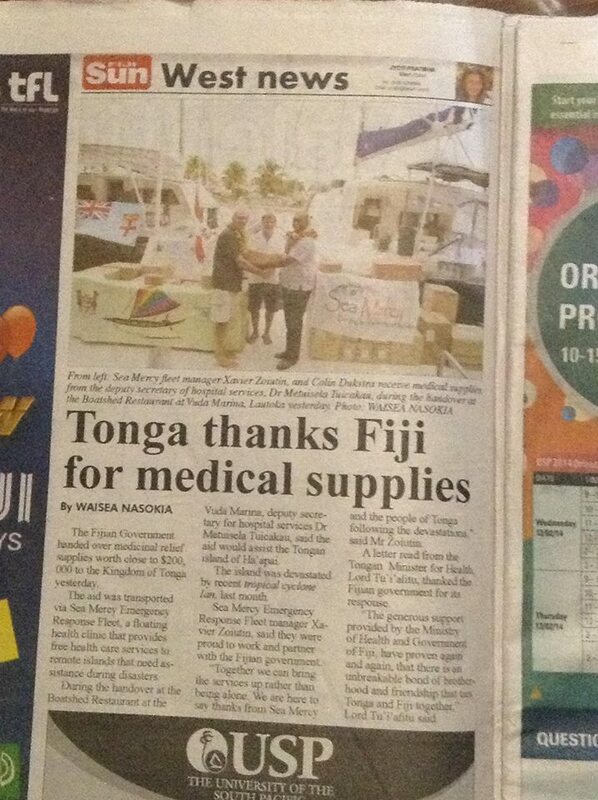 Sea Mercy has been operating in a Disaster Relief capacity for Tonga since February of 2014 (following Cyclone Ian). Although we generate field reports after every delivery or service call, there is not enough space to post every Report on the website (you can find most of them on our Facebook page). 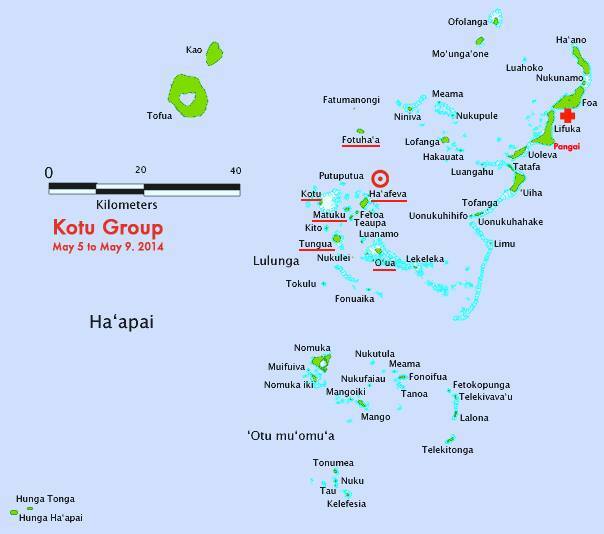 Below is a recent report from May 5th to May 10th in the Kotu Group in Ha'apai. We believe it and the associated pictures will give you an idea as to the range of services provided, the challenges faced, and the incredible opportunity that we have to make a difference. The island of Ha’afeva, our base of operations for the rotation, lies approximately 22 NM WSW of Pangai (the administrative capital of the Ha’apai Group). The weather forecast was S to SSE winds, 10-20 knots. Shortly after our departure the wind strengthened to 20-30 knots and clocked to slightly West of South — so it was a fairly boisterous sail with the wind hard on the nose! We ran with one reef in the mainsail and about half of the jib rolled-out and used the motors to help push us along. The primary anchorage in Ha’afeva is on the NW side. A pier is located here and makes for easy shore transfer. Holding is EXCELLENT and sheltered from all wind directions except west. In the case of west winds, anchorage can be had on the other side of the island in front of the village. We left Pangai at 08:00 in the morning with three persons on board: Moises (Public Health Inspector), “Little” Mele (Pharmacist) and Alise (Agriculture Officer — and Singer Sewing Machine Mechanic Extrodinare!). 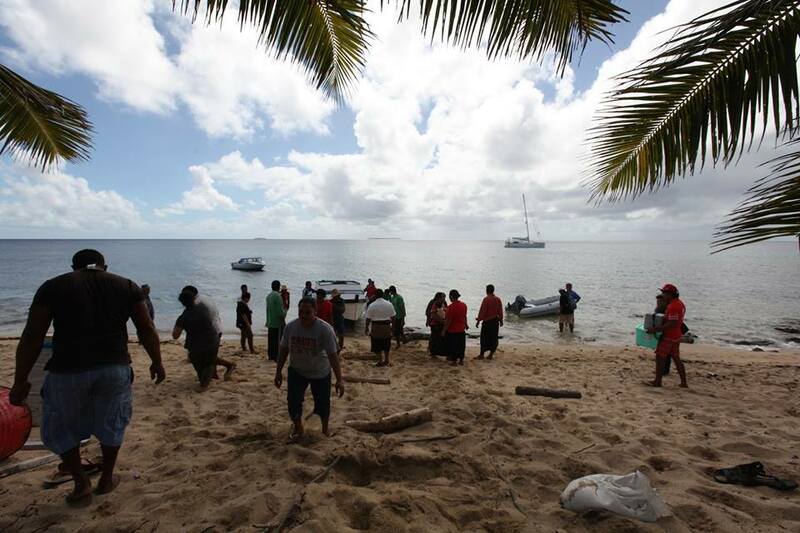 ‘Rebelle’ carried the balance of the team; Dr. Siale, Nurse Saane, Nurse “Big” Mele” as well as all the medical supplies! During our breakfast conversation around delicious warm nut bread we learned a little bit more about our team — and the impact that Cyclone Ian had on their lives. 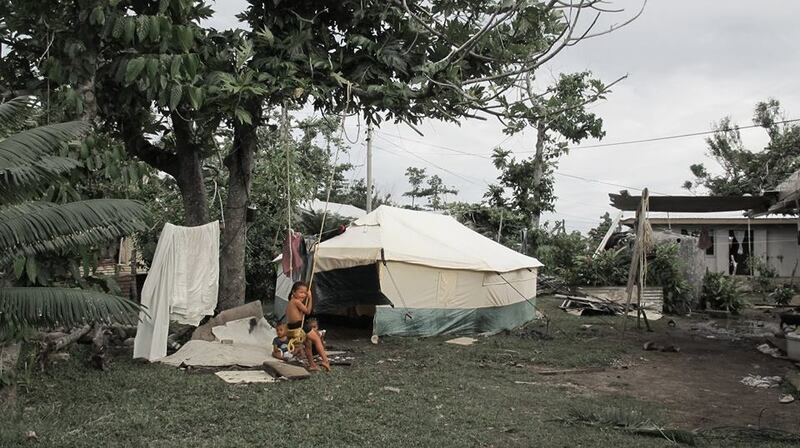 Alise is mother of four and lost her house during the cyclone, now she and her family sleep in one of the tents donated by the Australian Government. She had some help from her church (The free church of Tonga). Mele is mother of five. She and her family lost their entire roof, but still have the house. She is a Catholic and has received help from Caritas. We had previously met Mosese — he was the public health inspector that gave us free pratique when we first entered Tonga in Pangai! He is proudly a Wesleyan man. 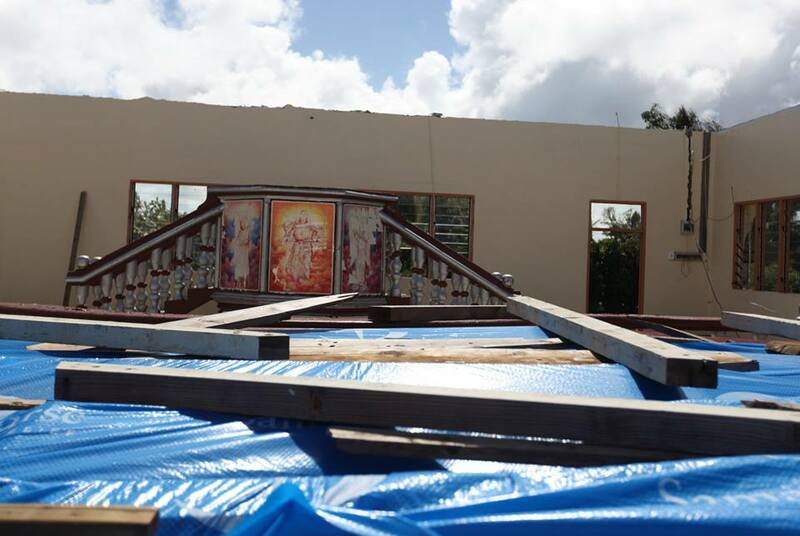 Much of the help that has flooded into Tonga comes from the various religious organizations. 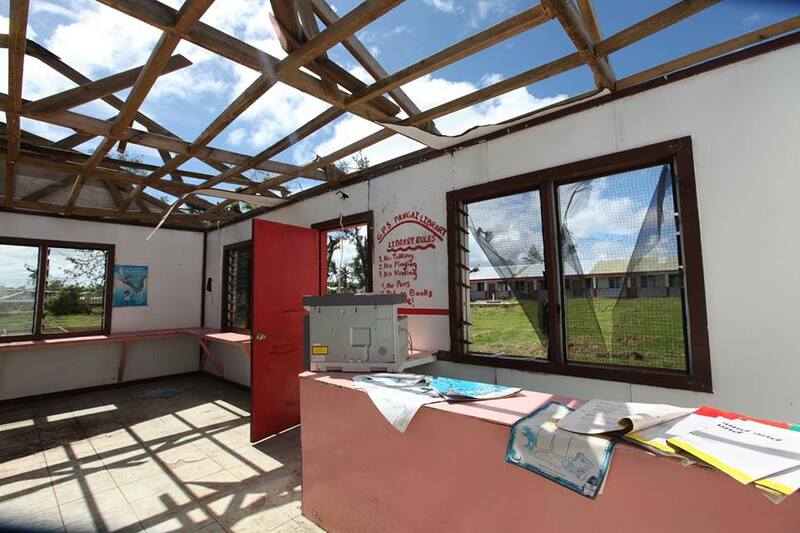 Ha’afeva was our base of operations for this rotation — the team was billeted in accommodations attached to the local clinic. We took a ride in the Truck with the team to visit the Village. They are 80 families living there, 8 churches and the main business is fishing and pig farming. Once the Team was settled in their accommodations and after doing a personal visit to the primary school Principal we were invited to join the Team meal. What a surprise!!! a delicious roast small pig, fish and yams. Mele the nurse gave us a big piece to take away for the captain! Kotu Island is located 3 NM west of Ha’afeva. It is surrounded by an extensive coral reef. There MAY be a passage to get close to the island, however, when we arrived we didn’t have visibility to attempt a transit and the team was picked-up by boat sent by the town officer. Excellent anchoring was found in protected waters at 19° 57’ 11.5” S / 174° 46’ 12.9” W — ‘though it should be noted that this location is NOT protected from wind from any quarter! While the Team was setting up the Clinic in the village hall, Mosese took us for a walk inspecting the village. 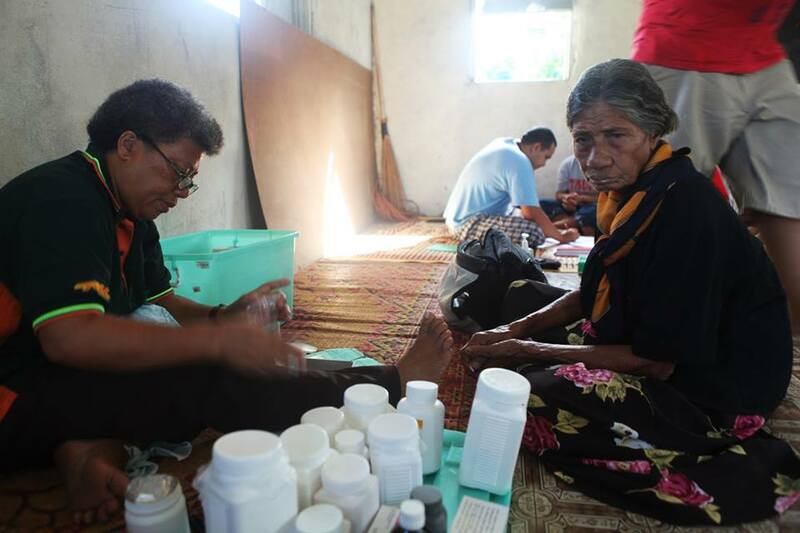 The medical team served a total of 38 patients. Alise was there to offer Agricultural advice and guidance — however, what she also brings to the table is something even more important to the local community — she’s a genius at fixing old sewing machines And she’s kept VERY busy! 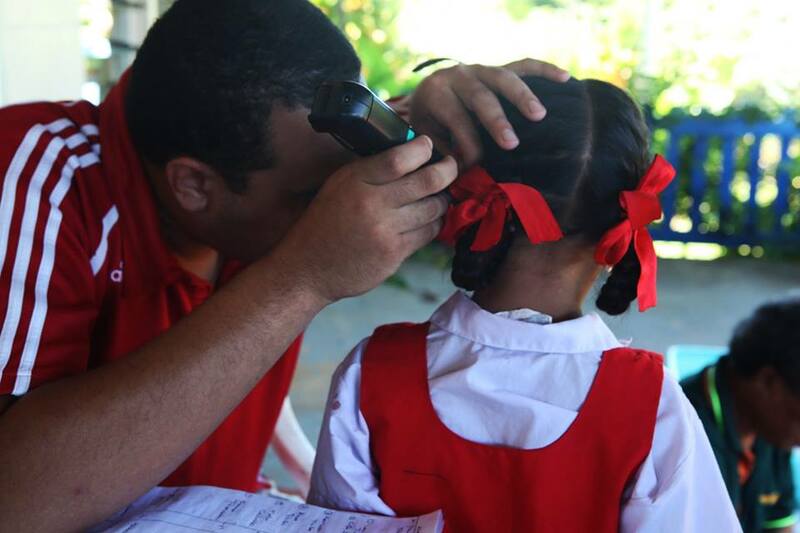 There were four elderly patients that couldn’t attend the public clinic, so Dr. Siale did home visits after the clinic finished. 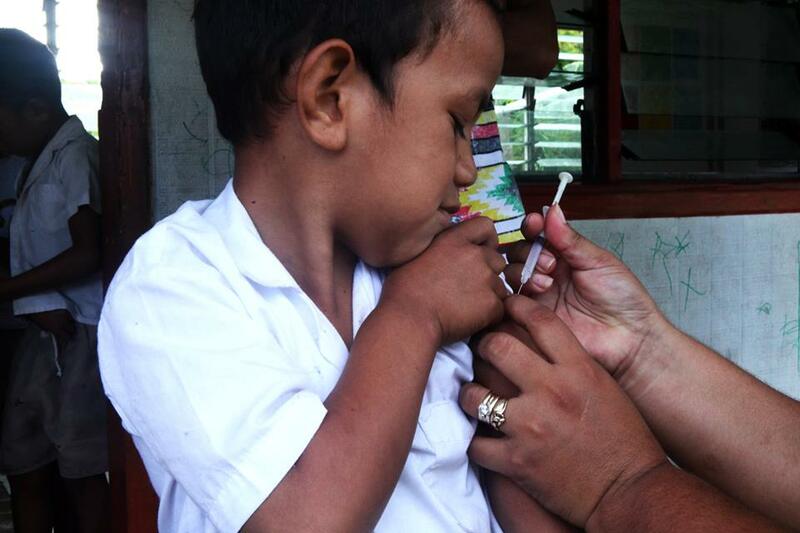 Meleia, a nurse from Ha’afeva, invited us to join her at the school to vaccinate the kids. Vaccinations must be administered to kids at 6, 10, 12, 14, 18 months and at age 5. 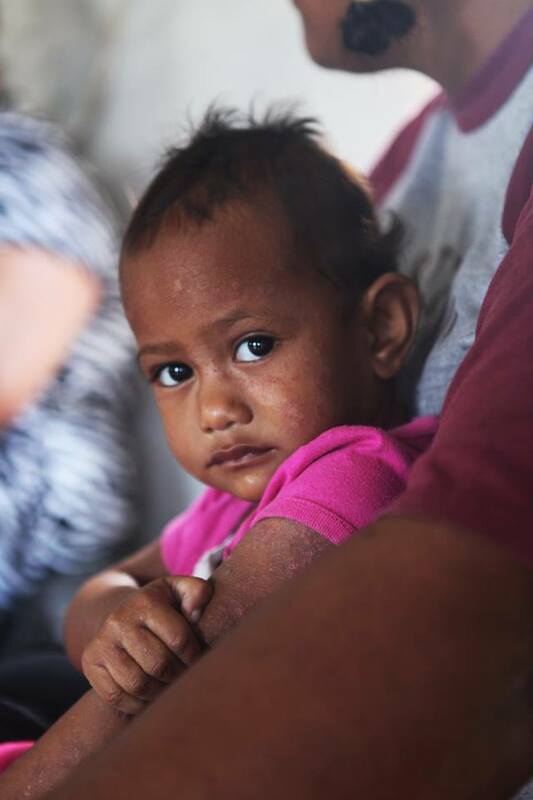 She is really happy we are here and why Sea Mercy is so important — kids need the vaccines on time and sometimes there isn’t money to pay for the gasoline and captain fees that Tongan ships ask for. In Kotu there are 39 households and all of them depend on rainwater. Only three houses have flush toilets and the rest share 7 pit toilets (outhouses). Every house has a small solar panel and generator. Enough only for light and donated by the government of Japan. The islanders prepared a delicious meal for us — corned-beef cooked in dalo leaves, fried fish and baked chicken. Back in Ha’afeva we were invited to eat Giant Clams prepared for one of the nurses. We decided accept the invitation and do another visit to the school director (Peter) with bags of School supplies — which were happily received as they have a shortage of the basics (pencils and erasers!). This Island is easily reached by small motorboat from the neighbouring hub of Ha’afeva — and as a result, fewer expectant mothers and babies were seen as they all of they go regular to the clinic in Ha’afeva. Despite this, the medical team treated a total of 33 patients. Mercedes paid a visit to the Primary school where the teacher asked her to teach the kids something about her country. In no time she had the kids dancing flamenco and playing bullfighters! 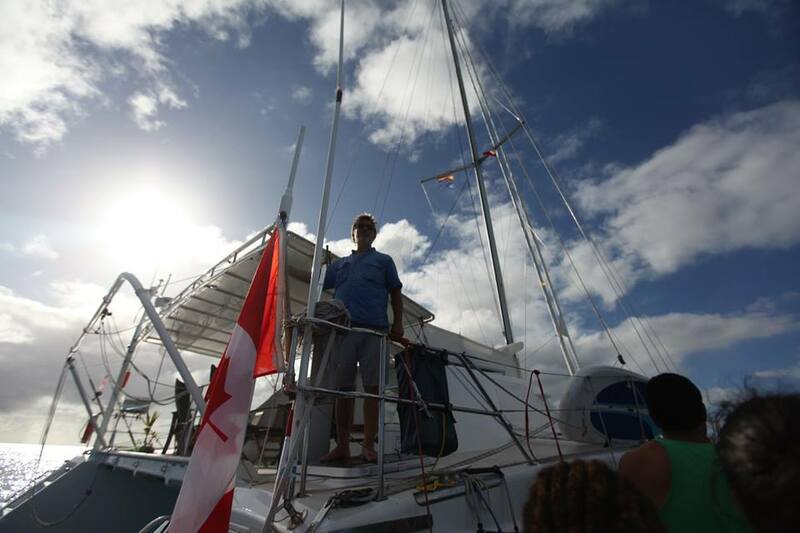 The kids were also interested to learn about circumnavigating of the world on a sailboat. Great Kids! Back on Segue the Team decided visit another Island in the same day. So while we sailed we took some cold juice and crackers to recharged our batteries before arriving at Tungua. Tungua is 20˚016 S and 174˚764 W . Has two reefs to the north in direction of Teaupa are called Luti (the nearest) and Rusell reef. The Island belongs to the Estate of Tu’iha’ateiho but there is also a royal Estate in the centre named ‘Alaloa the reason why Tungua is also called Sani Tungua (Glorious Tungua) is because it was the residence of Tamaha , The Royal Princesses and several are buried there in huge mounds. We are going to remember this island as the “kids Island”!, it was by far the one with largest youth population. 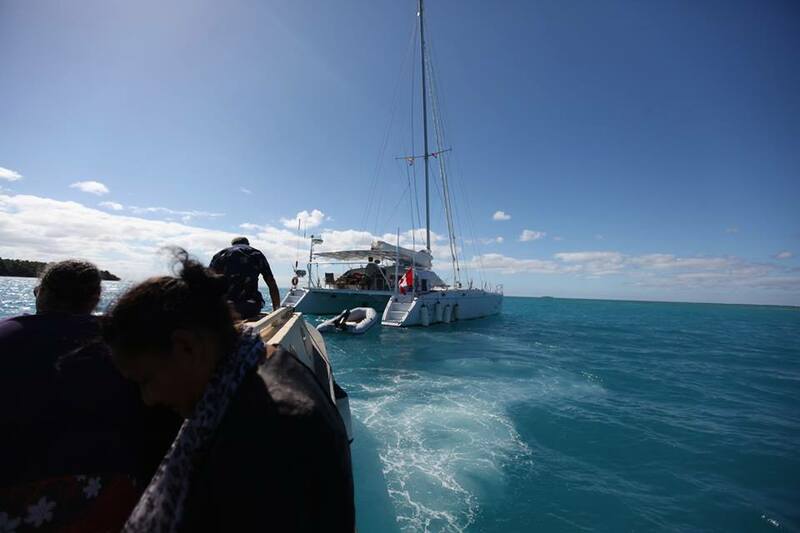 Unfortunately the anchorage there is not good, surrounded by reefs everywhere and on the windward side of the Island. Fotuha’a lies 8NM directly north of the Ha’afeva anchorage. Landing may only be attempted in ideal conditions and the town officer must be contacted in advance to assess the safety of gaining access to shore. There is absolutely NO anchorage possible as the island is the very tip of a volcano and the depths are well over 200 meters immediately adjacent to shore. 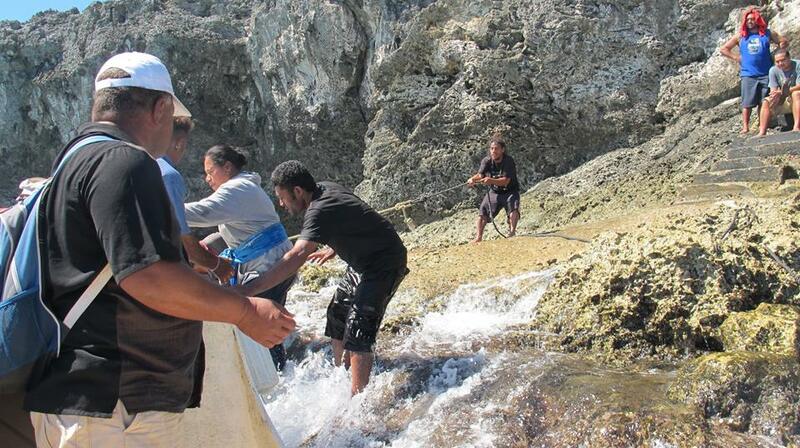 Shore access can only be done with the expert assistance of the local islanders. As can be seen from ‘Segue’s’ track, the only option is to drift while the team is onshore. On this day, we had what were considered ideal conditions — winds of 7-10 knots from the SE, with 1 meter or less ground swell. 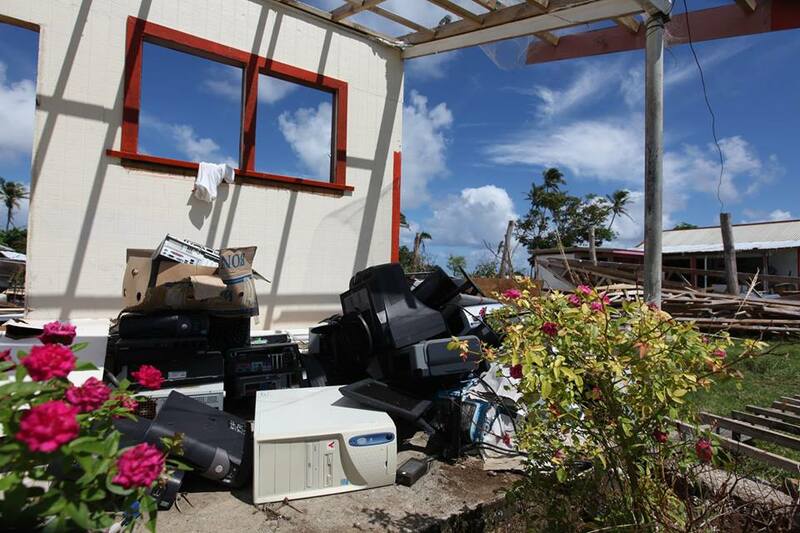 Mele and Saane remained in Ha’afeva to conduct interviews on behalf of the hospital. In their place we were joined by a big Police Officer! A really happy guy despite his huge Cava hangover! What a great paradise were policemen are such a mellow and relaxed guys! We surprised the team with a tall stack of pancakes and the best Quebec Maple syrup. The trip was very comfortable and made short by smiles, jokes and good humor. As soon we saw Fotuha’a shore we knew why Saane and Mele decided stay to do job interviews in Ha’afeva! First, there is no chance at all of anchoring there and second a wild volcanic rocky coast with big waves splashing is our welcome! 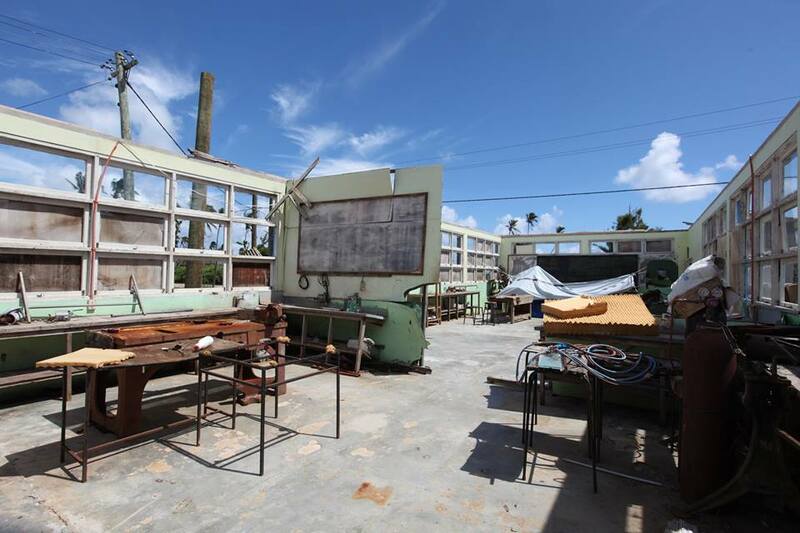 Dr Siale explained how difficult it is to reach this island — so assuming that the school is going to need lot of materials a backpack is filled with all that can be transported. Colin brings Segue as close as he dares to the Island with careful attention to the swell and the forbidding coast. 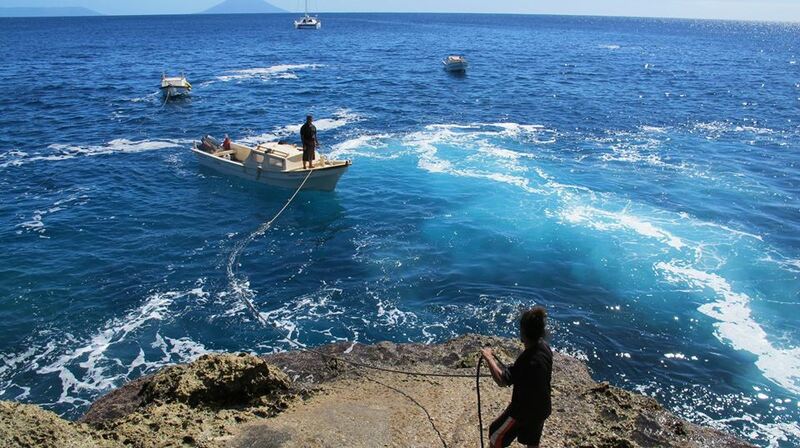 The local boat comes to pick us up — and the only thing on our minds is how get ashore in one piece! We try keeping a sense of humor. These women are incredible as Alise had a really bad jump and she hurt herself but she never lost the smile on her face. Fotuha’a is going to be remembered as the Island were this amazing Team risked their lives!!!. The island is the very tip of a dormant volcano some 10,000 meters under the ocean. Only the top 100 meters are above the sea. The village is located in the middle of the island and the soil is Volcanic. To reach the village we must first hike up the rocks, second take a a long flight of stairs followed by a long walk in the forest where we can see many plantations of pineapple, pumpkin, kasava and Taro (yam). Ironically, here in a Island were people need to do lot of exercise we found very high rates of high blood pressure and high cholesterol in the youth. The water comes from the rainwater. The Japanese donated one solar panel per house and surprisingly the primary school was one of the best supplied we encountered. Many patients slowly at first and late! Alise, the agriculture officer once again was working hard fixing the sewing machines, four in Total! As you can imagine, coming back the boat was a huge odyssey. Everybody was laughing so much that we didn’t concentrate on the risk and we just did it under the close scrutiny of Colin who was following our adventures while Segue was drifting at safe distance off the rocky cost. The Islanders prepared us a delicious fish feast that we enjoyed once back safely on Segue. O’Ua is surrounded by an extensive barrier reef system. There is a pass on the south side and a route through the reef to an anchorage located at 20° 02’ 50.2” S / 174° 40’ 55.8” W reasonably close to the village. Anchorage to Anchorage, the trip from Ha’afeva to O’Ua is just over 10NM to the south. The pass is marked by a pillar on the eastern reef (i.e.., take the marker to starboard). It is not wide; however, depth is fine (more than 5 meters). Care MUST be taken once inside the lagoon, as there are numerous coral heads. Do NOT attempt this without good overhead sunlight and clear conditions. 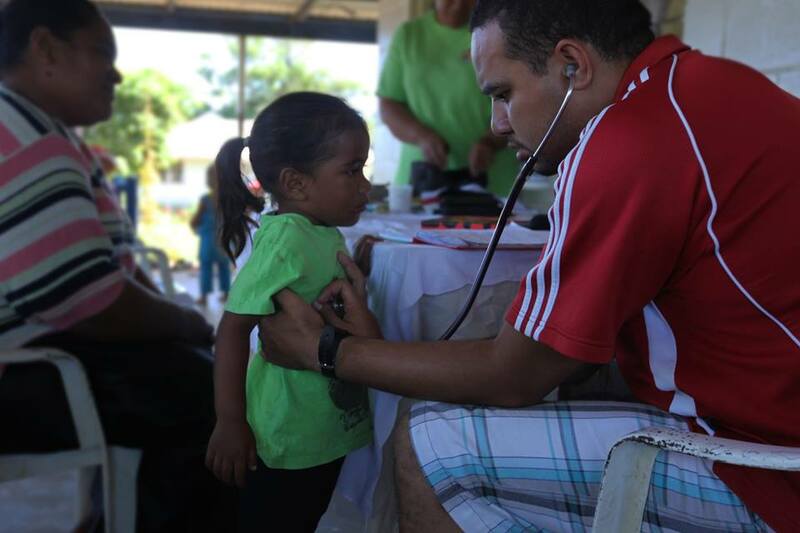 The medical team began their day at 6:00 am on Ha’afeva performing diabetes and cholesterol screening. 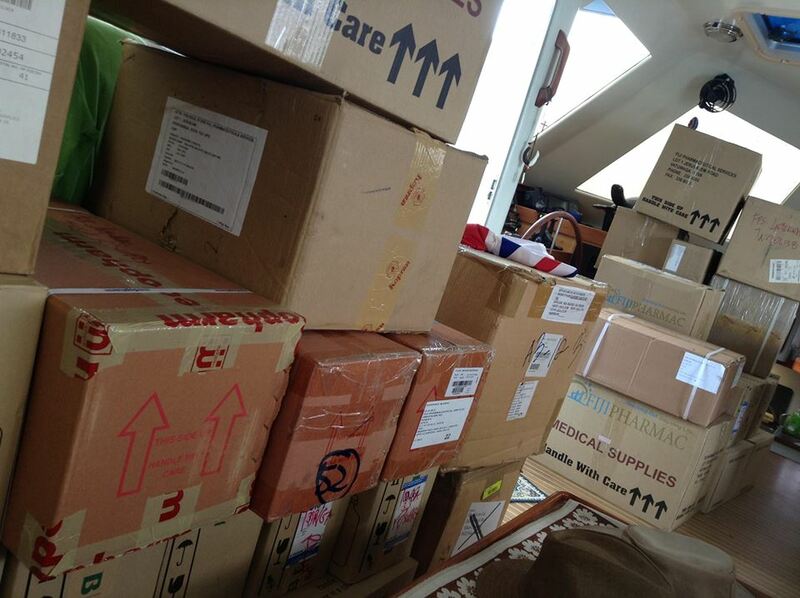 Once finished, they arrived at the dock and we loaded Segue with all the luggage, medical supplies and gift the team had received during all their visits. On board we had, Dr Siale, Saane, Mosese, Mele (little), Mele (big), Alise and the Police officer (hangover again, probably from the cava we donated the day before!). Chocolate Muffins for breakfast and videos of our adventure in Fotuha’a soon had everyone smiling again on our way to O’ua. The approach to O’ua is stunning. We needed to sail through two narrow passes, then pick our way around numerous coral heads to get as close as possible to the village. Once again, the Captain is destined to remain with the vessel as the holding isn’t great in the lagoon. O’ua is just 10 meters above Sea level — the colour of the water and the scenery of the island makes her deserving of the name of Paradise. A small floating Dock awaits us (a very pleasant change from the day before!). The island has lovely roads with lots of space between the houses. It seams a healthy and rich place. The clinic this time is conducted outdoors on the porch of the Wesleyan Minister. There are 22 households and all of then depending on rainwater — again every house has a solar panel. Here we found some people ill with the Chicungunya and lot of cases of the common cold. Only two men made it to the cholesterol/diabetes screening — Tongans can’t last too long without eating — and so most of the males favored breakfast versus their chance for a checkup! In total we saw 28 patients. One was a very small one-month-old baby with a sad history. His mom, who lives in Neiafu, abandoned him so the grandma decided adopt him. He was too small for his age. One incredible 21 year old beautiful young mom gave me 2 papayas. It was a great present, because in Pangai it is impossible to find fresh fruit since the cyclone erased all. The village didn’t cook for the team, so back on Segue we decided to prepare a huge pot of pasta Bolognese and another one with Mutton over potatoes. Of course one Papaya went straight to dessert. It was a long, but very comfortable trip back to Pangai, again lot of laughs, Tongan music in the background and some sleepy doctors on the couch.